Updated 12-4-18. During a single assignment, you may be asked to notarize more than one signature or even signatures on multiple documents. 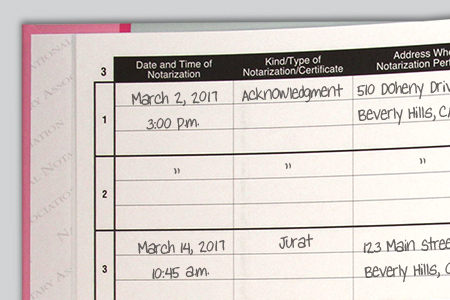 When you record these notarizations in your journal, how many entries do you need to make? Also, can Notaries use ditto marks or other shortcuts when information is repeated in their journal entries? Can I Use Ditto Marks In My Notary Journal? Ditto marks can seem like an obvious shortcut when recording the same information for multiple notarizations performed at the same time. But using them depends on your state’s requirements. The tips in this article apply specifically to journals that are designed for the information in a single entry to span two facing pages. The NNA’s journal is a good example of this. California journal requirements are very strict — the Secretary of State requires Notaries to complete a full journal entry for each notarization performed. California Notaries may not use ditto marks for journal entries. The reason for this is California Notaries are required by law to provide copies of information in their journals to the public upon a written request, and any line item provided must include complete information. Hawaii law states journal entries must be created “at length.” This would also preclude Hawaii Notaries from using ditto marks or other shortcuts in their journals. While Texas does not specify whether or not Notaries may use ditto marks or other shortcuts for journal, the state does require Notaries to provide certified copies of journal entries upon request. Because of this, the recommended professional practice for Texas Notaries would be to complete information required for each journal entry without using shortcuts. This will ensure that journal entries contain all necessary details. If you are commissioned in a state that does not provide guidance about journal shortcuts or does not require keeping a journal such as Florida, it’s up to you whether to use ditto marks. At a minimum, the NNA recommends always filling out the first entry on each page completely, and only using ditto or hash marks for duplicate information for subsequent entries on the same page. Can I Record Multiple Documents In One Journal Entry? When notarizing multiple documents for a single signer, many Notaries ask if they can combine information from all the documents into a single Notary journal entry. Again, this depends on state law. Arizona and Nevada permit Notaries to group information about multiple notarizations performed into a single journal entry if the notarizations were performed for the same signer or on similar documents at the same time. Other states, such as Hawaii and California, require a separate, complete entry for each individual notarization. In states that do not say one way or the other, the NNA recommends making a separate entry for each notarial act, but using ditto marks as described above. This helps keep the information in your journal easy to read while cutting down on the work required to create multiple entries. Who May Ask To See A Notary Signing Agent’s Journal Entries? Thank You for this newsletter! It has been very helpful to me. I have checked with a few different sources, California does not require separate journal entries for each notary on the same signing, however, it is recommended but there is no law in place. Please see this statement from the California Secretary of State's office on page 4 of the official 2014 Notary Newsletter (http://notary.cdn.sos.ca.gov/forms/notary-newsletter-2014.pdf) and linked in the article above: "Remember that you may be asked to provide a copy of a line item in your journal, which is why each line item entry must be complete. You cannot use hash marks, ditto marks, arrows, or other shortcuts." This appears in the middle of your article so I need to get rid of it therefore I am completing it. Thank you. Hello. If you are having technical issues reading any Bulletin articles, please contact us at social@nationalnotary.org so that we can assist you. My Notary journal has a list that gives the ability to check if the document is an Ack. or a Jurat, and I'm able to mark multiple documents per entry. Unfortunately for the professional Notary Signing Agent who follows the law and regs to the letter in CA: Title and lender packages I've seen lately have had 20-26 separate signatures to be notarized. 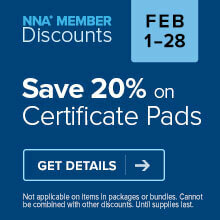 This means that each document signature notarized must have a complete, separately written journal entry. Which I do comply with, but I know many local NSA's don't follow this rule and take short cuts. @Ray Leyva, this is not an easy nor quick process. I have discussed this with signing services at length and they will not pay more for these onerous signings. I should be receiving $10 per signature for the work involved. Ha, in my dreams! $100 total is the most they are paying for everything that must be done for a complex signing. This is another way that our work has been cheapened to the point of not being worth it. Since no one but no one will listen to reason, I now routinely turn down jobs when I know the pattern of that particular title company to request so many notarized signatures for so little money. I do not agree that California requires a separate journal entry for each notarization when notarizing multiple documents for a single signer. I do agree that California notaries may not use ditto marks for journal entries. Hello. Please see this statement from the California Secretary of State's office on page 4 of the official 2014 Notary Newsletter (http://notary.cdn.sos.ca.gov/forms/notary-newsletter-2014.pdf) and linked in the article above: "Remember that you may be asked to provide a copy of a line item in your journal, which is why each line item entry must be complete. You cannot use hash marks, ditto marks, arrows, or other shortcuts." So thankful Arizona allows us to group entries! I sign estate plans with anywhere from 15-20 signatures and I can't imagine having to fill out a separate entry for each one. In 20 years in CA, I have never had a public request for a journal entry or court order/peace officer request for my journal. However, if I did, I would never want to be possibly charged with a misdemeanor on an improper notarization due to not completing a separate entry in full for each doc. So, when possible, I take about 15-20 minutes to pre-fill the notary certificates (with the exception of my signatures & stamps) and complete separate journal entries for each notarial act prior to the appointment. In order to do this, I must exclude unnecessary information and thumbprints in my journal (i.e. addresses, thumbprints for non-real estate/non-POA docs). If the NNA does not create a streamlined version of a Journal for signing agents (with some pre-filled portions such as Type of Notarization and Identification of Signer), I will probably create my own journal and market it to signing agents. What are your thoughts? In CA, Does the non-use of dittos or arrows apply also to columns that are optional, not mandatory? For instance, Jurat or Ack is required, so we could not use dittos or arrows for that. But what about the signers name and address, which is not a mandatory column? In CA, does the non-use of dittos or arrows in notary book apply equally to both required columns (e.g. Ack vs. Jurat, date/time, ID) and optional columns (e.g. name/address of signer or address where notarized)? Hello. In the CA Secretary of State's 2014 newsletter for Notaries linked above, the Secretary of State specifically instructs Notaries not to use hash marks, ditto marks, arrows, or other shortcuts for journal entries. I'm a California notary and while I respect the Calif Secretary of State's comments, this is not law. The notary's requirements can be quite onerous at a signing, often with more than 7 notarized signature per signer (with decreasing pay thanks to *&^%$#@! Snapdocs!). To answer Len Taylor, I use the Modern Journal of Notarial Events and it comes with check boxes for the common real estate/loan related documents (including indicating whether it's a Ack or Jurat), so even if 10 notarized signatures is needed, only 1 'line' in the journal needs to be completed (in most cases) per signer. If a copy is ever requested (in my 11 years, that has never happened), I would simply provide that one line item, since all the notarized signatures are related to that real estate/loan transaction and it's irrelevant if one sees the full list of documents notarized in that one transaction. If a husband and wife, known personally, are signing multiple documents (Title & Loan Documents) is a single notary entry in the journal acceptable. Their Arizona licenses are kept on file? I don't think the almost 5-year-old Statement" from the Secretary of State office is actual law. It is merely a one agency's interpretation, based on an improbable scenario, and is not an actual law. Making a separate journal entry for each individual notarization is impractical, time-consuming, and totally unnecessary, in my opinion. This requirement needs to be revisited and reconsidered as it places an unbearable burden on the notary with no increase in our fees. Title and lender, over the last few years, have been sneaking more and more requirements (scan backs or faxbacks, for instance) and refusing to pay additional fees for additional services! Now they are starting to demand that we take photos of IDs and signed documents and TEXT them back from the signing table! Since this function is one that causes extra charges for my cell phone, I refuse and tell them they have to accept scan backs when I get back to my office (for which I charge for the time involved!). When you total up the number of hours involved in a signing, from receiving and printing the documents, drive times to and from, actual time spent at the signing table, time to scan documents, package them, and drive to the drop site, then deduct actual overhead and expenses plus background checks, notary supplies, etc., then take those that total dollar figure and divide it by the actual fee paid and the final dollar figure, which is what we receive in payment for our work, you will see we are lucky to be getting less than half of the minimum wage. And the fees offered are getting lower and lower. I sat down with a woman who thought being a notary signing agent would be a good way to make some money. I showed her how to figure her business overhead, just like the IRS allows, and showed her how laughable the fees are, and explained how much time she will spend on each order. At the end of all the arithmetic, she saw she would actually receive less than 5 dollars an hour, and nowhere near the state fee for each notarization. She decided she had been sadly misinformed about how she could make a lot of money! To top it off, notaries who have been in the business fir many years are given pages of extra instructions from lender and title alike that are almost insulting! If the signing agent doesn't already practice these most basic things, they should not be hired! Makes me wonder why I keep doing it. It sure isn't for the money or respect! I have always been proud to be a professional in my work. Now I wonder why I bother. The only people who seem truly happy about my work are the borrowers I deal with! Sad. Hello. If you are referring to California's guidelines for recording information in journal entries, the CA Secretary of State's 2018 Notary Newsletter includes the following instructions on page 2: "If you are notarizing multiple documents for a signer or signers, each notarial act must be indicated clearly in your journal. Hash marks, ditto marks, arrows, lines, or other shortcuts do not meet the requirements for entering a complete notarial act into your journal." Also on page 3: "California law (Government Code section 8206(a)) is very specific with regards to the required elements for notary public journal entries." You can find the 2018 CA state newsletter online at https://notary.cdn.sos.ca.gov/forms/notary-newsletter-2018.pdf. Hawaii Notary Office does not interpret law for us. I understand "at length" but I fail to see how putting in the description that there were "three originals," etc, of the same document by the same signer, with the same I.D., does not meet the "at length" requirement. More to the at length should be taught to give more information in the document description, rather than only "deed," who is the grantee, and for what property (short description). That is the part that will prevent the loose certificate from being detached and reattached to another document all together. I do a lot of work for an estate planning attorney, and often have upwards of 10-12 documents to notarize at once. I bought small ink stamps that say "Acknowledgement," "Jurat," the address of the office where almost all of my notarizations are done, and "CA Driver's License." These save a huge amount of time and wear and tear on my hands writing everything. The stamps cost about $40 total. Makes it much easier and much faster. Some comments about the discussion in this series: for those who question the validity of a "5 year old statement from the Secretary of State," or state that they "respect the SOS's comment," the SOS is the person/office that manages/permits notaries by STATUE, so any such document should be followed strictly. Saying that you don't have to follow them is like saying you don't have to pay attention to instructions from the IRS in their statements - see where that gets you. And unless there is a newer statement to replace it, the statements don't expire. The legal principal of stare decisis (law based on precedent and precedent is good until overturned no matter how old). Anyone doing real estate notarizations can simply point out to the loan people that the State of California authorizes a fee of $15 for EACH signature. Quote Government Code 8211 which specifies the fees. Since you have to record each item (Gov. Code 8206(2)(b)), each separate item is a separate signature and entitled to the $15 fee. In addition, if you are doing work other than what is required by statute, you should be entitled to an hourly compensation for anything other than the notarization. Making copies, etc., etc., is not part of the notarization process. Just yesterday, I did back to back 11 notarizatiins each. That’s a LOT of info to record while someone is waiting and staring at me. Lucky for me I don’t mind long, awkward silences.